This was not a good week for our friend Ravi Chakrabarti. He might be both anecdotally and canonically The Best, but Ravi’s flaws were on full display as he continues to reel from the revelation that Peyton and Blaine slept together. Even writing out the reason that Ravi is so out of sorts is tough to take, because although it is realistic that he would be so upset by the one-two punch of learning this fact and then having to sit by while Blaine saved Peyton’s life, him actually being this visibly upset about what Peyton chooses to do with her own body and life is incredibly cringe inducing. But it’s the juxtaposition of knowing Ravi is mentally spiraling over something that’s none of his business, while still somehow sympathizing with him because we know he’s a good person who’s just put himself in a terrible mental place, that ultimately makes the story work. Last week I said that Ravi needed more to do than moon over Peyton, and this is the episode where that mooning finally becomes action. The problem is that everything Ravi does in this episode backfires on him, because he goes about almost all of it the wrong way. He tries to talk things out with Peyton, but ends up somehow acting like he’s the wronged party who deserves an apology. He then later confesses to Peyton that he’s in love with her, but does it in front of everyone while haranguing Blaine about his past as a horrible person and trying to guilt him into taking the memory restoration serum. And when Peyton puts aside everything Ravi previously did wrong to tell him that she returns his feelings, he kisses her while the other woman he just slept with is in the next room over. Not great, Ravi! 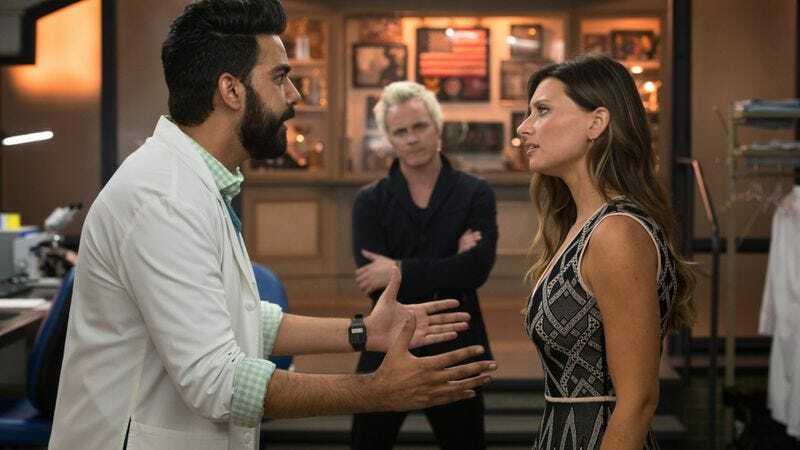 It’s a spiral of doom all around, and could have been a disaster for Ravi’s character (and Peyton’s, too), but the show does a smart thing here: It never lets Ravi be the one in the right, or asks you to sympathize with his actual actions. When he tries to guilt Peyton into an apology, she calls him out on it and reasserts her right to do whatever she wishes with her own life. (“Your opinion on this matter is irrelevant” is one of Peyton’s best moments to date.) Even when she’s forgiving him at the end, it’s clear that she isn’t giving him a pass on his actions. That’s what makes the revelation that he slept with Dr. Kupps so brutal—Peyton said the only person keeping them from happening was Ravi, and in the end that turned out to be exactly what he did, all over again. It’s a tough and complicated and sad place for the story to go, and in the end Ravi might have done exactly what he didn’t want to do and pushed Peyton right into Blaine’s arms. In addition to Ravi and Peyton’s heartbreak, there was a little heartbreak for Major as well as he starts to come to the realization that he is going to have to take the cure soon, which means potentially losing all of his memories. His sad, longing looks at Liv this week were a welcome reminder that their love story will never quite be over as long as he has all of his memories intact. Major’s imminent cure also comes right when he’s finally getting the hang of mercenary training and still searching for Natalie, two stories that aren’t quite getting the screen time they need to be fully developed enough for us to care yet. What Major’s story does the most, though, is serve as a nice character counterpoint to Blaine’s. Major staunchly stating that he’s taking the memory serum no matter what because he wants to do everything he can to remember his life clashes nicely with Blaine stating that he has no desire to remember anything about his old, awful self. This makes Blaine deciding to take the memory serum have much more emotional stakes, even if it’s still up in the air whether it will work or not. If it did, Major’s story wouldn’t be nearly as rich because he could just take the cure and be fine. However, Blaine remembering everything about his past and potentially being regretful knowing that he can choose a different path also has tremendous story potential. It’s pretty good writing when either way, it results in great stories for either one or both of these two characters. The case of the week was fairly straightforward, serving mostly as an excuse to get Liv into super-Zen mode and spout a lot of meditative buzzwords while Clive looks on in disbelief. That’s an element of the show that seems trivial in comparison to all of the heavy lifting the specific character storylines take on, but the longer the show goes on the more I appreciate the variety and humor that the cases bring to the show’s landscape every week. And let’s face it, Liv can’t have a major story arc in every episode when the ensemble is so important and strong, so this gives Liv a way to be in a huge chunk of the episode without having to invent contrived character stories for her every week. Let’s end by talking about Blaine’s father, because his is the story that feels the least settled in at this point. Angus DeBeers is an awful person, so him coming back to get his willed money from Blaine (now that he’s “alive” again) and then immediately reminding Blaine’s that he hates him works well. What’s less clear is what exactly is going on with his weird zombie-only club (dubbed The Scratching Post, naturally) and why he is teaming up with Don E to do any of this. Granted, Don E is a really fun character who is generally a pleasure to watch, but with everything going on in the show right now these club scenes are definitely the lowest thing on the priority list. Obviously this is setting things up for something bigger down the line, I just hope for things to get a little more interesting along the way to getting there. When everything else is so strong, that seems inevitable. Ravi sleeping with his old boss after confessing his love to Peyton is almost exactly like the prom episode of Veronica Mars when Logan sleeps with Kendall after his “epic” speech to Veronica. 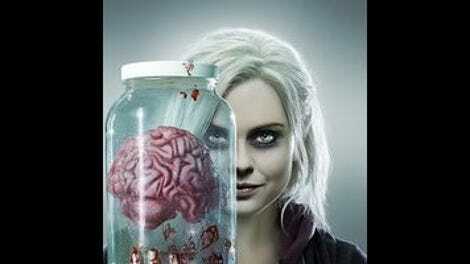 Why do you need to stir up these painful old feelings, iZombie? I want to live in a constant loop of Major and Justin playing Dance Dance Revolution (or whatever that game was supposed to be). Justin is fun, more of him, please. Blending a brain into a chai latte sounds really, really gross, Liv. Isn’t that texturally weird? Blaine magically getting a job as a lounge singer is incredibly contrived, but if it lets us hear David Anders sing every week I will allow it. Especially if they do more endings like the one here, with Blaine singing while Don E looks in from the window while standing in the rain. Last week I speculated that Blaine was maybe faking his memory loss, but there didn’t seem to be many clues to that here. Either way, both David Anders and the writers have settled into this post-memory loss Blaine in a way I think is fairly interesting, so that’s a good thing. Did they really bring Ravi’s old boss in just to almost figure out the zombie secret, then sleep with Ravi and ruin his relationship with Peyton? Surely, she’ll be back to cause more zombie secret drama. Surely.